Prior to the Union, Scotland didn”t have a great deal in its story of which to be proud. Its history is little more than an endless tale of internal feuding, punctuated by fighting the Vikings, the English, and the Scottish Highlanders as well as each other. Contrary to popular imagination, for a fair amount of the nation’s history the greatest antagonism was reserved for the Highlanders. In one of the most emotive moments in the annals of Anglo-Scottish relations, the 1745 Jacobite Rebellion, there was disastrously little lowland support for Bonnie Prince Charlie’s largely Highland army. Even at Culloden, there were approximately 2,500 Scots fighting in the government army. The Jacobite forces only numbered about 5,000. If you expand that to the rest of the British army, there were more Scots serving George II than there were serving the exiled Stuarts. The Jacobite rebellions were about religion and inheritance and had very little to do with England and Scotland. Both George I and the Old Pretender had exactly the same amount of British ancestry through the same great-grandparent (King James VI), contrary to the old saw about one being a Scot and one a German. But that is all forgotten now, and the same lowlanders who turned their back on the Catholic Stuarts now curse the name of their Protestant cousins who presided over Scotland’s greatest period of glory, the Scottish Enlightenment. 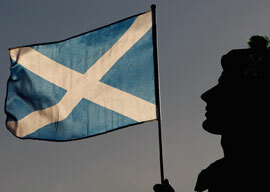 It is forgotten that Scotland’s apogee came after, not before, the Union. It is hard to imagine the world of Hume, Smith, Burns, Ramsay, Adam, Carlyle, and Watt without the peace and cultural cross-fertilization that was caused by joining the two kingdoms. That is what those who believe that the Union represents the greatest achievement of this little island’s inhabitants need to celebrate. It is hard to win a political campaign on negatives. Yes, you can counter someone’s arguments and even demolish them. But you need to come up with a positive campaign as the central platform. Today’s Unionists are failing to do that. Their energy is spent pointing out the real perils of leaving the Union. If they want to maintain their lead and win, they have to move on and start to shout out the advantages. Don”t try to persuade your spouse to stay with you by raising the question of alimony. If you want to stay happily married, show the strength of your love. It is the English stereotype to be stiff and reserved, but this is not the moment to play Mr. Darcy. Just once, we need to let Mr. Bingley be the hero of the day.